These are 4"x6" cards printable on card stock for you to print at home. 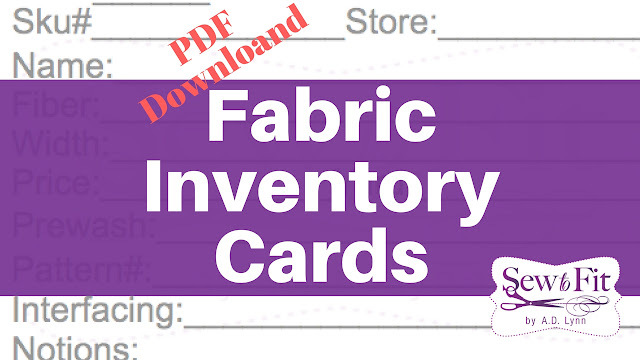 The instructions for using this cards are included with a video to help you organize your fabric stash. ***The instructions for printing and cutting are included in the file and includes a 1 page printable. These are miniature sloper/blocks used during my classes that you can use to practice with when watching my video tutorials or to test your own designs. They are half scale of a women's size 8 pattern. These patterns consists of the.. This pattern enables you to develop a flat pattern design in half scale and try it out on a form before you go through the work of rendering in full scale. it is more efficient for completing more fitting adjustment practices in the time available. Designers will be able to quickly experiment with various concepts, either by draping or flat pattern, before committing to the sample making stage. It's really good for Zero Waste try-outs!